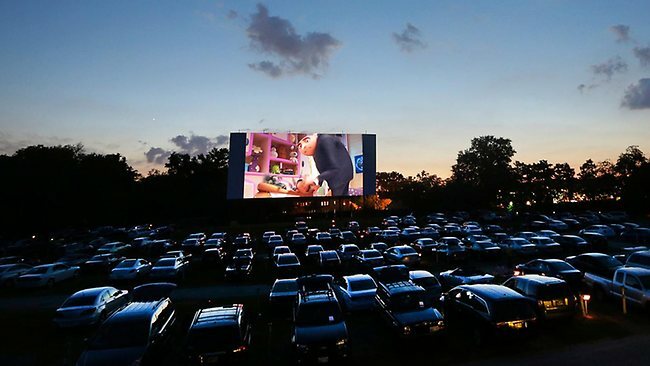 Ever since my four-year-old was born, we have been taking him to the drive-in movies. Images such as him peaking his little head up over the seat to look through the car door window and smile at my wife and I will be memories I will hold onto for years. While the four-year-old seems to have taken right to the drive-in, his little brother is not so inclined. First of all, if the baby is up past his bedtime he makes everyone know he is not happy about it. Secondly, the baby cannot sit still for more than three seconds. Just when you think you have him playing a fun game or throwing the ball back and forth, he suddenly turns into a kitten and runs off after nothing in particular. The kid has to keep moving, while his older brother is more than happy to stay in one place. The family has been taking the babies, or at least the oldest one, to the drive-in for years. But this most recent weekend I got the chance to take the oldest to the drive-in by myself. I will admit that I was not sure how things would turn out. While the little guy loves going to the movies, he doesn't actually watch the movie very much. He is either on his Kindle playing games, eating popcorn, or forever playing with the door lock. But the boy knows me, and before I can say anything about the door locks he looks at me with that smiling face and suddenly the door locks are not an issue. I was the responsible grandfather and put the boy in his seat and buckled him in for the journey to the drive-in. When we got there, the place was pretty empty, so we could wander around wherever we wanted. I put him on the swings for a few minutes, but when I pointed out the merry-go-round he desperately wanted to give it a try. His first ride on a man-powered merry-go-round was a rousing success. I told him to hold on tight, and he did. But it only took a few revolutions of the merry-go-round for the little guy to feel adventurous. Standing up and sitting down alternately, he would find new ways to grip the safety bar and new ways to give his Bapa a heart attack. But he had fun and he got his popcorn when it was all done. Throughout the movie, my boy behaved better than I had ever seen him. I folded a blanket for him to sit on so he could sit up front with me and see over the dashboard. But, just like every other movie night, it was the Kindle that captured his attention. He would alternate between watching the movie and playing on his Kindle, with most of the time focused on the Kindle. He would ask questions and laugh at the movie, and we had a good time. Why am I telling you this story? Because this is how a lifelong memory is made. For me, it is something I can hold onto for the rest of my life. Now I know that he likes to go to the movies with just me, and that opens up possibilities that did not exist before. For him, it is that kernel that gets planted in his little brain that hopefully grows into a deeper love for the drive-in, just like his Bapa has. Reading this may not mean much to you, but it meant the world to me. Hopefully, 15 or 20 years from now, it means a lot to him too. 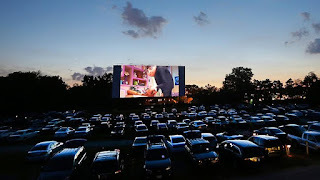 Whether I am there or not to help him take his own kids to the drive-in for the first time, at least I know that I did what I could to keep a family tradition going from one generation to the next. George N Root III is the proud grandfather of two awesome little dudes. Follow him on Twitter @georgenroot3, or send him a message at georgenroot3@gmail.com.